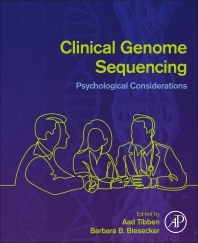 Clinical Genome Sequencing: Psychological Aspects thoroughly details key psychological factors to consider while implementing genome sequencing in clinical practice, taking into account the subtleties of genetic risk assessment, patient consent and best practices for sharing genomic findings. Chapter contributions from leading international researchers and practitioners cover topics ranging from the current state of genomic testing, to patient consent, patient responses to sequencing data, common uncertainties, direct-to-consumer genomics, the role of genome sequencing in precision medicine, genetic counseling and genome sequencing, genome sequencing in pediatrics, genome sequencing in prenatal testing, and ethical issues in genome sequencing. Applied clinical case studies support concept illustration, making this an invaluable, practical reference for this important and multifaceted topic area within genomic medicine. Dr. Aad Tibben was professor at the Department of Clinical Genetics at the Leiden University Medical Center, Leiden, the Netherlands and has a private practice as a psychotherapist. Dr. Tibben served as project Leader of the research line on psychological effects of predictive DNA-testing for late onset hereditary disorders. In 2018 he received the first Aad Tibben Award from the European Meeting on Psychosocial Aspects of Genetics (EMPAG). Dr. Tibben has published more than 170 papers in peer reviewed journals including the European Journal of Human Genetics, the Journal of Genetic Counseling, and Clinical Genetics. Dr. Barbara B. Biesecker is a Distinguished Fellow at RTI, International. Dr. Biesecker was Head of the National Human Genome Research Institute’s (NHGRI) Genetic Services Research Unit and Director of the Johns Hopkins University/NHGRI Genetic Counseling Graduate Program for 24 years. Dr. Biesecker served as president in 1989, and received the National Leadership Award from the National Society of Genetic Counselors in 2015. Dr. Biesecker has published over 150 papers in peer reviewed journals including JAMA IM, Genetics in Medicine, Patient Education and Counseling, Clinical Genetics and the European Journal of Human Genetics.